Last week I was flipping through the channels on the television and came across an old Man V. Food Nation episode. The one where Adam Richman was in Boulder, Colorado visiting a restaurant called The Buff. The main food item mentioned is a meal called Saddlebags. Basically pancakes with your choice of bacon or sausage placed in the pancake, topped with an egg. How is this relevant to beer? 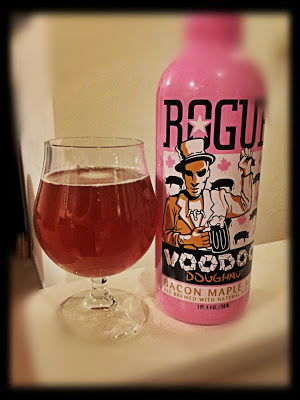 So.. here I was, watching Man V. Food Nation, salivating over the Saddlebags, the bacon kind – of course, and thought, mmm I bet Rogue’s Voodoo Bacon Maple Ale would be great with this meal. 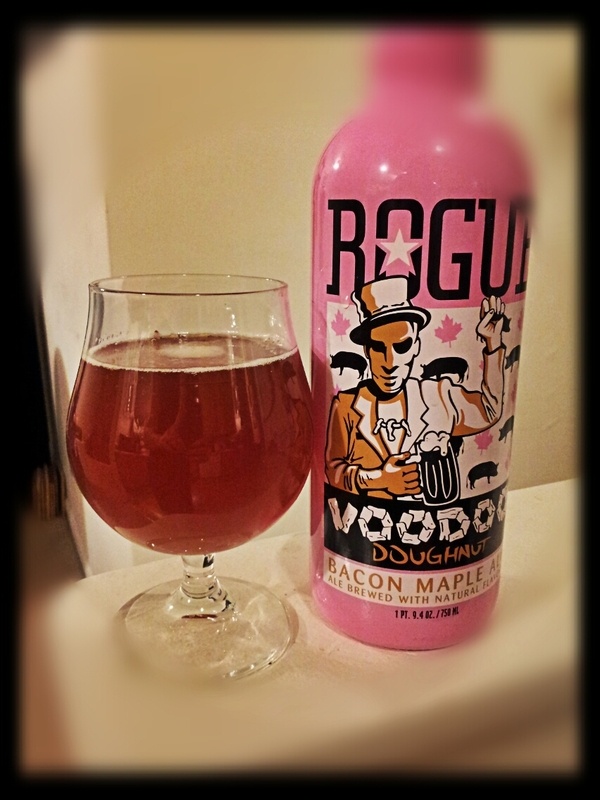 Always a fan of breakfast for dinner, I enlisted a friend come over for dinner and have pancakes filled with bacon, with a side of bacon and of course, to drink – Rogue’s Voodoo Bacon Maple Ale. Now, I’ve only had one kind of maple ale that I can think of. Actually during a recent IndianaBeer meeting at Black Swan Brewpub, I had a half pint of their Maple Oat Ale. This year’s brew was less heavy on the maple syrup flavor than last years. Still a good, smooth brew, but it was missing one of my favorite ingredients – Bacon! Back to my dinner. We made four pancakes with bacon crumbles in the pancakes, the rest without. And had plenty of bacon on the side. Filled up our glasses, set the table and got out the real maple syrup to give this beer pairing dinner a good start. If you drink the ale after eating the pancakes covered in maple syrup, it becomes a little harsh, almost bitter to the taste. As if the maple syrup on the pancakes and the maple syrup flavor in the beer become enemies. It wasn’t undrinkable, but it was noticeable. Just eat the bacon alone and drink the ale, they are a well-balanced pair. Moral of the store? Just eat bacon and drink more beer. It was a fun experiment. I may have to get my hands on some more unique brews and combine them with food. I’m sure someone has done Flat 12 Bierwerks Glazed Ham Porter with an actually Glazed Ham. Let me know if you have tried Rogue’s Voodoo Bacon Maple Ale or what you think it goes paired with the best. It goes paired best with the drain at bottom of your sink. Wow.. the drain at the bottom of my sink has expensive tastes. I can give it water for free. I need to read the blog before posting. I came in a couple days too late. I loved it! Drank it with no food and yearned for more!